I made this impromptu (well maybe not so impromptu since it had to freeze for 4 hours!) dessert for a Pork barbeque party our friends Megan and Victor hosted last weekend! Victor is a southern Virginia boy and made a fabulous vinegar based sauce to accompany his pulled pork. This was the perfect light dessert to offset our insane gouging of pig! Very very interesting flavor and texture contrasts with the creamy whipped cream and then crunchy chocolate and meringue! I let it sit out for 15 minutes before I served it and that caused a funny sight. Some of the fellow grad students that came for dinner took one look at the cake and started oogling! They apparently wanted to leave after the pork extravaganza, but decided they wanted some dessert. Lo and behold I put the 15 minute time thawing stipulation (on the microwave timer no less) and they just sat there staring at the microwave and then I served it right after 15 minutes! A couple of minutes later after I finished my slice, I looked around for them and they were gone! 😀 Anyways, it was thoroughly enjoyed by all and I loved how it was a totally different take on a ice cream cake! Check out the recipe from Design Sponge! 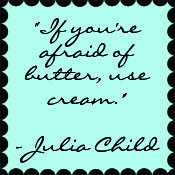 Whisk the cream. Mix yogurt, egg yolk, powdered sugar, the content of the vanilla pod and the lemon zest (only the yellow, not the white). Turn the yogurt mix into the whipped cream. Spread 1/3 of the mix in a springform, approximately 10 inches in diameter. 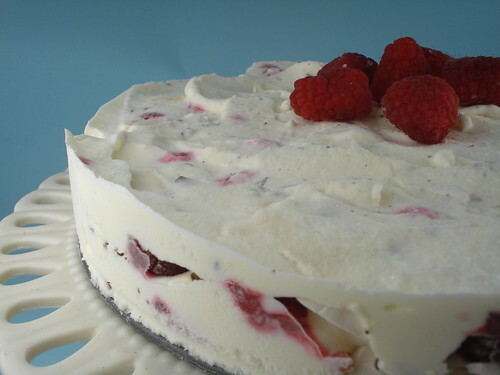 Cover with a layer of meringue and sprinkle over raspberries and crushed chocolate. Repeat with another layer of yogurt mix, raspberries and chocolate. End with a layer of yogurt mix. Cover with plastic and freeze for at least 4 hours. Place the cake in room temperature 15 minutes before serving. Decorate with raspberries. Yum! What a pretty cake and it looks refreshing as well. Beautiful!! Thanks for linking up at our Table! !